Organised by The School of UX. Supported by Balsamiq, Indigo.Design, Sketch and PingPong. Every conference of ours has a theme. Back in September 2018 at the iconic Design Museum in London we explored collaboration between UX designers and researchers. See photos on Flickr and watch some talks on YouTube. Whilst it’s popular to talk about the latest trends, our conferences have been focusing on what we think is the most challenging part of design – communication between each other: internal company politics, presenting value of design and speaking the same language with different stakeholders. 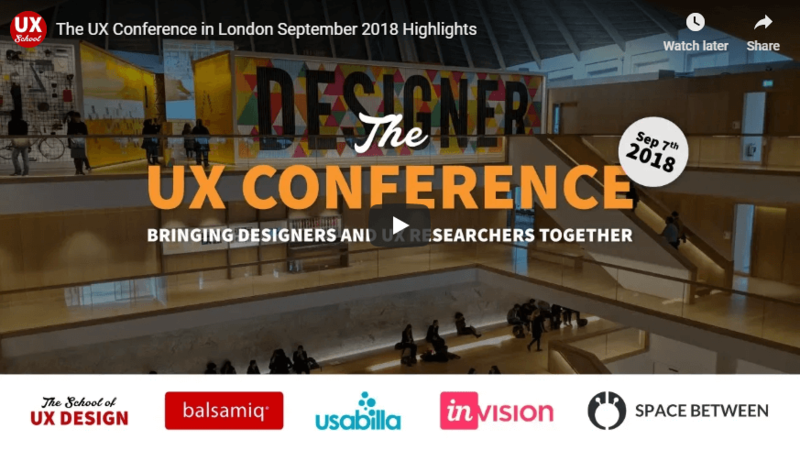 Join us and our speakers from LEGO, Canonical, Which?, Ocado, Monzo, Automattic, Condé Nast, Booking, Virgin Atlantic and others to explore how designers can help businesses grow through UX & marketing; surely no matter how great our UX research & design can be – our products and services won't sell on their own? Please note, the event will be recorded on video. If you can't make it in person – feel free to order professional video recording as a ticket option. The conference will run at Tobacco Dock on Wapping Lane, St Katharine's & Wapping, London E1W 2SF. It's a 5-minute walk from Wapping overground or Shadwell DLR stations. The conference is organised by The School of UX and made possible by all of our amazing partners. If you are interested in supporting our event – please drop us an email. The School of UX runs affordable in-person UX design courses & mentoring by professional designers in London for everyone. Balsamiq Cloud is a web app for fast & collaborative wireframing. You'll generate more ideas, so you can throw out the bad ones and discover the best solutions. Indigo.Design is a unified platform for visual design, UX prototyping, code generation, and app development by Infragistics. With powerful features, an intuitive interface and an expansive plugin ecosystem, Sketch lets you create your best work — from your earliest ideas, through to final designs. PingPong takes care of all your moderated user interview needs in one place: from recruitment to payouts. Conduct effortless user research, remotely in the UK and beyond. Sticker Mule is the fastest and easiest way to buy custom printed products. The place for designers to find answers. Online UX design courses and literature by design experts. Platform to discover the best digital marketing agencies in the world. The practice of UX is relatively young when compared to marketing. Our community has certainly come a long way in recent years, but our friends in marketing have decades of learning on us. In this talk Martyn takes us through some of reasons that the challenges designers face today can be solved by learning more about the history of marketing and how many of the trends we see in UX today are a result of innovations dating back to the mad men era. Head of Digital Experience at Virgin Atlantic. Previously worked at some of the world’s top brands including BBC, Channel4, Sony, O2, Easyjet, Tesco, John Lewis and Ikea. In this talk Chimmy will explore how to communicate user needs as business needs. Senior UX Designer. Recently worked on Vogue and GQ at Condé Nast. Previously UX Designer at New Look and British Airways. Monzo's mission is to make money work for everyone. This is the story of how design helped us accelerate from prepaid cards to fully fledged bank, bringing our incredible community with us every step of the way. Hot coral cards and intuitive interactions, coupled with seamless customer service, are just a few of the ways we've reached over 1.3 million customers already and continue to grow by thousands more everyday. Product Designer at Monzo Bank. Previously at carwow and Gousto. Why you should swear in your comms to gin drinkers: Measuring and using personality insights in a digital context. In this talk, Patrick will explain the science of personality and how to measure it in your users, both actively and passively (and online and in real life). He will also explain how to practically use these insights in your digital outreach, making websites and communications which speak to users in the targeted manner to which their personalities respond the best. Behavioural scientist at Brainchimp turning mind into magic. All of the experiences that reach the customer are a result of the decisions we make, and the way in which we make these decisions not only impacts the customer experience but also our own experiences in the workplace. In this talk I’ll be exploring how we can design the space to have more effective interactions between Marketing and UX; to make better decisions faster; and ultimately to deliver more value to the customer and create a happy place to work. Principal UX at Which?. Previously Senior UX Designer at SapientNitro and Rightmove. In this talk Francesca will share the lessons she's learned about blending UX and Marketing. Principal User Experience Architect at TandemSeven, Previously led design of Ubuntu at Canonical, Apple iTunes, Heathrow, the European Space Agency and Mulberry. This talk will draw on Tammie's experience being a designer in open source, not only exploring how UX design and marketing works in that industry, but also looking into the future of how we can create a space for designers to thrive. Experience Designer at Automattic (company behind WordPress.com) leading design on Gutenberg – a project redoing the publishing experience for WordPress. Many outside the UX circles tends to focus on the wireframes and visuals as the main product of UX. To me, the real magic happens though before. Your company may have been in business for many years but how well do you really know your users and stakeholders? I will look into how UX and user tests can improve collaboration and sharpen your argumentation. Currently Lead User Experience Designer at Stibo Systems. Previously Senior User Experience Architect, Innovation and Development at LEGO. Passionate, holistic and analytical thinking product focused corporate entrepreneur with 15 years on the frontier of user centric design and architecture. The cracks are showing, and they are deeper each time we meet. We are getting increasingly frustrated with how things are. Eventually we have ‘the talk’ and decide it is time to go our separate ways. We’ve all been there, breakups are hard. Leaving a job to a new role is hard. Losing customers to another product is hard. This talk will reveal the deep connection between relationship and user experience, and provide useful tools to develop a strong and happy bond. Currently UX Lead at Ocado Technology, building Ocado Smart Platform. Previously working with startups. Always learning. This talk is about growing a business through good user experience. When you hear this, you may think that I just mean “good design means more customers”, but this talk goes deeper than that. I will talk about applying UX throughout a business and how this kind of user focused thinking, can allow your business to grow more organically, with less penny pinching, less cost and in less time. AVP UX Designer at Barclays. Previously led UX at Booking.com. Designed and developed user experiences for universities, growing businesses and charities.